A few people have asked me to run some calculations on certain players, and given how easy it is to do with the spreadsheet in front of me, I figured that this would be a resource that at least a few people would be interested in having on their own computers. 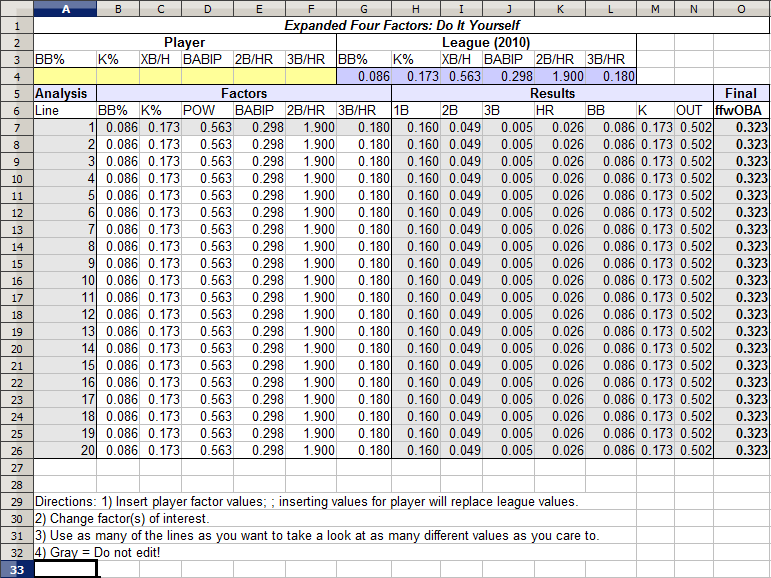 Again, I would remind you that this is a bit of a work in progress, but here’s version 1.0 of the Expanded Four Factors spreadsheet. It’s not a terribly complicated spreadsheet to use, but here’s a screenshot and a quick overview. In its base form, the chart will show 20 lines of the league average 2010 player. In order to replace the chart values with those of your player of interest, enter his factor values into the yellow (FanGraphs Beige?) cells. You can go ahead and change the value of the average player, too, if you want to see how things were in different seasons, although this won’t affect anything once you’ve entered the value for an individual player in the yellow cells. Once the factors are entered into the yellow cells, you’ll have an original line for your player, which will appear in line 1. As such, you probably don’t want to edit line 1 at all. Then, after that, you can use lines 2-20 to take a look at lines with different values for the four factors, and you can change one at a time or all four, although making graphs with four different independent variables can be challenging. Don’t mess with the formulas under the “results” section unless you feel like changing up the methodology in some way, and if you do I highly recommend you save an original copy first (or bookmark this post) as the equation, particularly for HRs, isn’t exactly intuitive. That’s all I can think of to add here; if you have any questions/comments/mistakes/etc. to point out, you can of course use the comment section, contact me over twitter, or email me at jhmoore AT wisc DOT edu. We hoped you liked reading Expanded Four Factors: Do It Yourself (1.0) by Jack Moore! I think this here stat is the beginning of something substantive… as having an efficient way to analyze regression and variance has been something that has haunted my dreams. Well done good sir, and much thanks for making it available. b. Of immaterial subjects: Having an independent existence or status; not dependent upon, subsidiary to, or referable to something else.